EDEM is high-performance Discrete Element Method (DEM) software for bulk material flow simulation. This video shows how EDEM can be used to aid the design process of dump truck bodies. 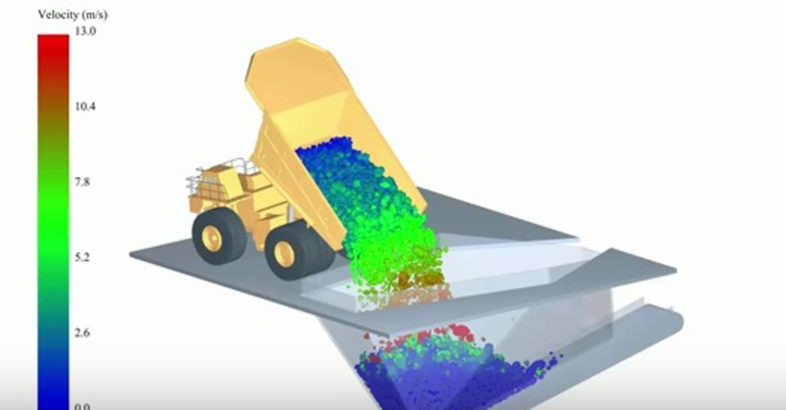 Realistic material modeling allows users to test dump truck performance in different operating conditions by analyzing loading/unloading patterns or pressure distributions. This is good but the issue is how to transfer the material unloaded in the hopper further. Take for example a biomass boiler which uses solid biomass fuel. Directly unloading in hopper will obviously save space requirement for the customer but the issue is how to transfer it further. Can you Pl throw a light on this. Hello Nandeesh. Thank you for your comment. Using EDEM simulation software you can investigate different designs of hopper/boiler and also investigate different materials (such as biomass) and how they are transported. EDEM can be used for many applications – you can see more examples and information from our website and if you have a specific question or want to expand on your initial comment please contact the team directly. Thanks.